Multi-purpose stack-only Divider Boxes are ideal for use in commercial, industrial, electronics and healthcare markets for storage, assembly, fabrication and distribution applications. 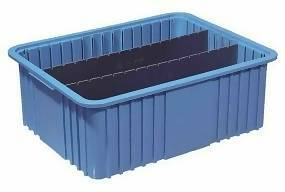 Containers are available with a variety of covers, dividers, collars and options. LEWISBins+ Divider Box containers, with easy-to-add dividers, can be customized for any product size and quantity to maximize tote capacity. All containers can be divided into compartments on 1.25" centers. Divider Boxes are also stocked in ESD-Safe materials. 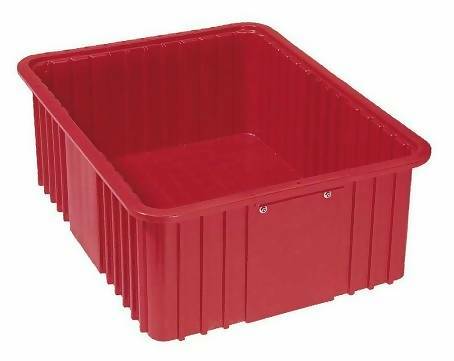 Choose from industry standard containers and sizes. Multiple identification options for added flexibility and efficiency. Choose from four optional cover styles for product protection. 2 cardholder snaps included on all DC and NCD series boxes. Snaps for DT series are available upon request.